Trauma Sensitive Yoga is a specialized type of practice that provides simple and incredibly effective tools to help students heal from PTS and other symptoms caused by experiencing traumatic events. Although the incredible positive impact that this specialized Yoga practice can have is well documented, it is still considered to be a luxury by many of the organizations that work with the under-resourced communities in our area. Our highly trained teacher will be offering Trauma Sensitive Yoga at the Union Settlement's Johnson Counseling Center, a Not For Profit Mental Health clinic that has been providing services to the East Harlem community since 1953. 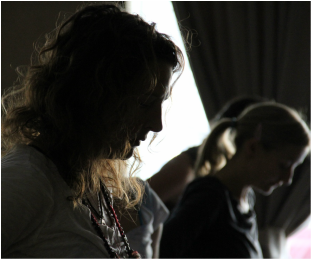 Many of the clients in this clinic have experienced and witnessed shocking amounts of trauma over their lives, and it is our mission to provide the highest level of Yoga and Meditation to them to assist their recovery. Jennifer has been teaching Yoga since 2006 and is also enrolled in an MA into PhD program at the New School for Clinical Psychology studying the intersection of contemplative mind/body practices and western psychological therapy. She has a special interest in how they can serve trauma populations, and be informed themselves by those populations. In addition to being 350 hour certified with Jivamukti Yoga, Jennifer is also an Urban Zen Integrated Therapist who teaches with Urban Zen & Beth Israel Hospital. She completed the Warriors at East training in 2016 focused on offering Yoga and Meditation for PTS and Traumatic Brain Injury. She works with the Buddhist Teacher Michael Stone in an ongoing mentorship, and teaching Yoga classes in NYC and Brooklyn. Union Settlement is an on-the-ground resource for East Harlem residents of all ages, and a passionate advocate for the needs of underserved communities. Since opening it's doors in 1895, they have brought education, wellness and community-building programs to our neighborhood, empowering New Yorkers with opportunities to better their lives. By helping neighbors realize their goals, they build the vitality and success of East Harlem. The Johnson Counseling Center is a licensed mental health clinic with a reputation for providing the highest quality comprehensive mental health services. Founded in 1953, the center was named after author, educator and civil rights leader James Weldon Johnson. Generations of families continue to use the Center and attest to it's history of successful services. These services are provided by sensitive, experienced mental health professionals and are offered to children, adolescents, adults and older persons living in East Harlem and surrounding neighborhoods.